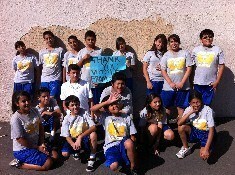 The Running Team is part of SRLA (Students Run Los Angeles). Through this program, students train to run the Los Angeles Marathon in March 2017. The Team meets September through March after school on Monday, Wednesday, and Friday with longer runs and official races scheduled on the weekends. Practices include distance running, drills and strength training. We begin the season with short runs and build up to completing the marathon distance of 26.2 miles. Runners will receive t-shirts and medals at each race as well as running shoes for the season. Running a marathon is often a life goal, so why not complete it this year? Come join us! Please see Mr. Dumas in room 300 or Ms. Buenrostro in the Title I Office for further information.